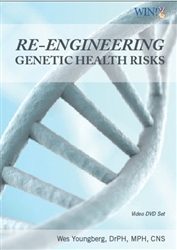 Re-Engenering Genetic Risks for Diabetes, Depression and More! This siix hour seminar would nicely complement Dr. Youngberg's new book "Goodbye Diabetes". This 3 Video DVD series emphasizes comprehensive lab testing and lifestyle treatments for PreDiabetes, Diabetes, Metabolic Syndrome, inflammatory conditions, etc... Lab tests discussed include: Glucose Tolerance Test with insulin and cortisol, Cardiac CRP, Vitamin D, Homocysteine, Ferritin and more. The final DVD provides a comprehensive overview of natural ways to optimize emotional and brain wellness. Each DVD is two hours and part of a six hour weekend seminar series.